Richmond Virginia native Joe C.L.A.S.S.I.C (formerly known as the artist named ANatural) was born Joseph Boykin in Kings County Hospital in Brooklyn New York and raised in Sethlow Housing Apartments. Due to the absence of his parents, he moved out of Sethlow into Pologrounds Housing Apartments in Harlem, New York when he was 10 yrs old. After the untimely death of his grandmother Gloria Level he was taken-in by his great grandmother, Willie Mae Boykin. Joe C.L.A.S.S.I.C always had a love for music & writing. At the young age of eight, he sparked his interest to create music. Watching artist such as Wu Tang Clan, Buckshot, MOP, Smif N Wessun, DJ Logic, The Repz, Heltah Skeltah, and the entire Boot Camp Clik perform on "Brooklyn Day" captivated Joe C.L.A.S.S.I.C attention. To gain more knowledge about the music industry as he got older, Joe C.L.A.S.S.I.C went back to school where he met Scott Man (a talented music professor who helped him record his first track). Scott landed Joe C.L.A.S.S.I.C his first radio commercial while he was in highschool. Joe would then teamed up with Critical Child Productions and went on to record many tracks in hope of landing a recording contract. They recorded at Bang Studio (N.Y), Squad Studio (N.Y), and Mystic Studio (S.I). He was later offered a publishing deal, which fell through due to bad management. 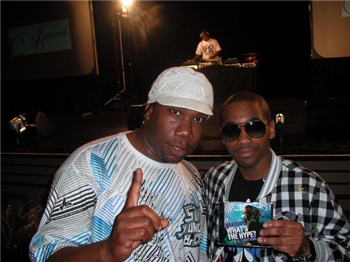 The Release on his 1st major project Whats The Hype Mixtape in 2009 hosted by DJ Teddy King (BET's The Deal) earned him honors amongst his peers and confirmed his position in the game. To further his career opportunities Joe C.L.A.S.S.I.C recently relocated to Richmond Virginia to join his brother Christopher Boykin in efforts to birth his own Record Label Timeless Muzic Entertainment Records. 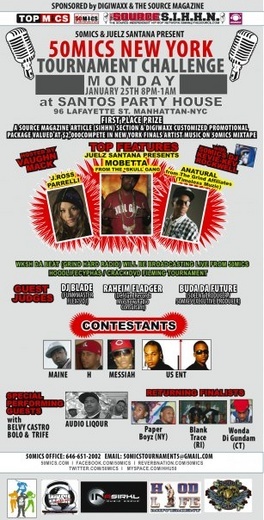 Having been Co-signed by DJ Teddy King (BET The Deal), clothing sponsored by SABIT NYC, featured in numerous influentual Publications like The Source Magazine, HipHopStardom101 Magazine & award winning Yo! 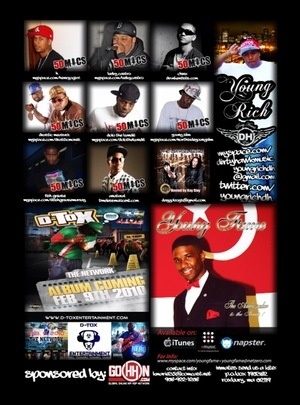 Raps Magazine, 100 + Gigs booked via Sonicbids, music debuts on several National FM Radio Stations, invited to perform at festivals & concerts state to state, and rubbing shoulders with A-List celebrities like Swizz Beats, KRS- One, Kid Capri, Mos Def. 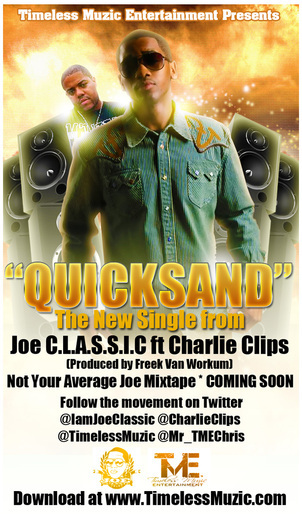 Joe C.L.A.S.S.I.C is all too familiar with hardwork, dedication and consistency and plans to give his loyal supporters & fans just that. 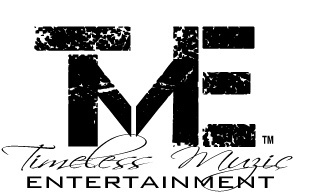 With a rapidly growing fanbase, new risiding home in the DMV & the support of his Co-Founded new management team: Timeless Muzic Entertainment LLC behind him, you can expect much more headlines from this promising recording artist in years to come! Reached 2nd in Best of Urban chart in 2011. In the top 20 for 12 weeks. Reached 45th in Best of Urban chart in 2015. In the top 100 for 20 weeks. Reached 36th in Best of Urban chart in 2014. In the top 100 for 11 weeks. Reached 67th in Best of Urban chart in 2013. In the top 100 for 2 weeks. Embattled is a funny word. With a connotation leading virgin ears to believe that it’s used to describe a subject fighting in at least a two-sided battle, it’s thrown around a lot to describe musicians (often rappers) and their struggles. Using that word to describe someone engaged in conflict is fine, but it gets irritating when the embattled subject has no one to blame but themselves. OurStage rapper ANatural (display name TheRealANatural) was embattled for real for most of his childhood and adolescence, but for no fault of his own. Bouncing around various NYC housing projects with no parents to speak of and seeing his beloved grandmother (also serving as his sole guardian) pass when he was only 10, it would be easy for Joseph Boykin to throw in the towel and let life devour him and his potential. But he didn’t. A strong sense of resilience triumphed the easy way out, and now Boykin finds himself fielding publishing offers and networking with TV personalities and, even more surprisingly, rapping like he’s king of the world. One such song with this lofty air is “Flyest.” It may be difficult for purists to make sense of lines like “more pictures/ more press/ lookin’ like VIPs/ no guests/ anything I feel I need I’m gonna get” if they’re fully aware of his history, but he wouldn’t be the first to separate rhymes and his past. Not everybody has to brood like Eminem. The beats underneath Boykin’s happiness, consisting of a repetitive lubricated synth arpeggio and a smothering helping of ascending chords as accompaniment, all combine to make the young MC sound like he’s walking on cloud nine. “Go Getta” follows in the same vein with adequate ego trips, but this time the sound is an amalgamation of electronic snippets, 80s hair metal guitar power riffs, and a barrage of kick drum. While his happiness was tinted with conceit in “Flyest,” that conceit is now pushed to the forefront as he furiously rhymes about being a boss capable of doing it all, but not without giving a little advice along the way: “Livin’ large is right/ I suggest it endorse it perfect it/ madness for the method/ roll with the punches/ I’m ready for the next one/ go until the wheels fall off/ this ain’t a test run.” Though enormously subdued in comparison to “Go Getta,” Boykin keeps the didactic effort up in “Is It Me?” Opening with morose piano and a slick minor synth riff, the track never really grows past its humble beginnings, unlike the life and times of ANatural. That said, we should probably pay attention to the guidance he gives us. Despite the egoist rhymes in the aforementioned tracks, something tells me that lines like “Everywhere he go no desk work/ sleepin’ on the floor while his spine and his neck hurt/ all you can do is be the best you/ best kept secret step into those shoes” and “keep spittin’ til you see green like Flynn, don’t expect nothing not a thing out of them/ not a chain not a gem/ not a hi not a bye not a grin/ wish them the best whether enemy or friend” are really ANatural’s true colors. Homegrown philosophies from the school of hard knocks are the best he’s got, and it’s safe to say they’ve worked for him thus far. ANatural's been climbing the rap game ladder since his first LP at the age of 14, and he shows no signs of slowing down. His first major music project, Musical Therapy, has caught the attention of B.E.T.’s DJ Teddy “The Deal” King who’s agreed to host it, and it was released last Tuesday July 27th. Get it while it’s hot! ANatural was born Joseph Boykin in Kings County Hospital in Brooklyn New York and raised in Sethlow Housing Apartments. Due to the absence of his parents, he moved out of Sethlow into Pologrounds Housing Apartments in Harlem, New York when he was 10 yrs old. After the untimely death of his grandmother Gloria Level he was taken-in by his great grandmother, Willie Mae Boykin. ANatural always had a love for music & writing. At the young age of eight, he sparked his interest to create music. Watching artist such as Wu Tang Clan, Buckshot, MOP, Smif N Wessun, DJ Logic, The Repz, Heltah Skeltah, and the entire Boot Camp Clik perform on “Brooklyn Day” captivated ANaturals attention. To gain more knowledge about the music industry as he got older, ANatural went back to school where he met Scott Man (a talented music professor who helped him record his first track). Scott landed ANatural his first radio commercial while he was in highschool. ANatural teamed up with Critical Child Productions and went on to record many tracks in hope of landing a recording contract. They recorded at Bang Studio (N.Y), Squad Studio (N.Y), and Mystic Studio (S.I). He was later offered a publishing deal, which fell through due to bad management. He decided to move to New Jersey with friend and business partner, Bim Star. They both had aspirations to be successful. During this time Anatural observed Hip Hops ever changing evolution and how it was being portrayed. 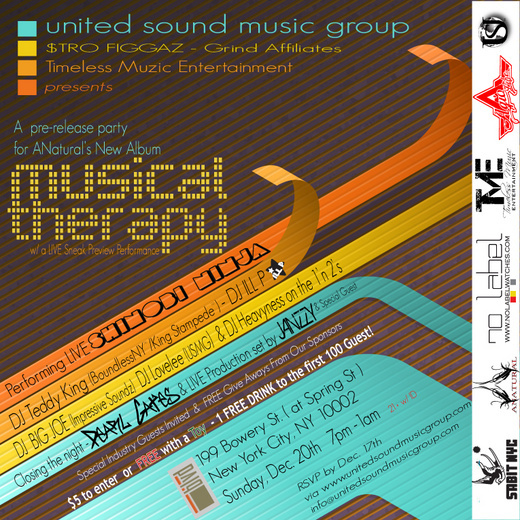 ANatural found his place for Hip Hop, incorporating several other genres of music such as Techno, Fusion, Rock & R&B. With production, ghost writing, & Song writing under his belt, ANatural shows his well rounded ability to be a force in the music industry. And thats what you can expect from ANatural. 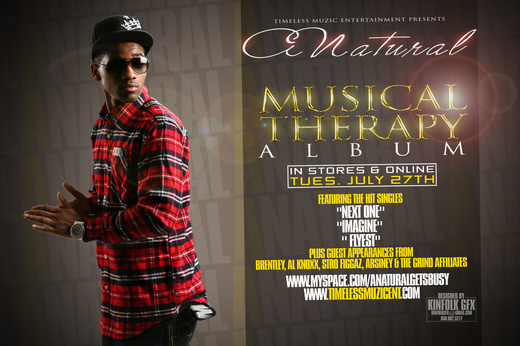 I recommend you checkout ANatural new EP Album "MUSICAL THERAPY" its a awesome project! 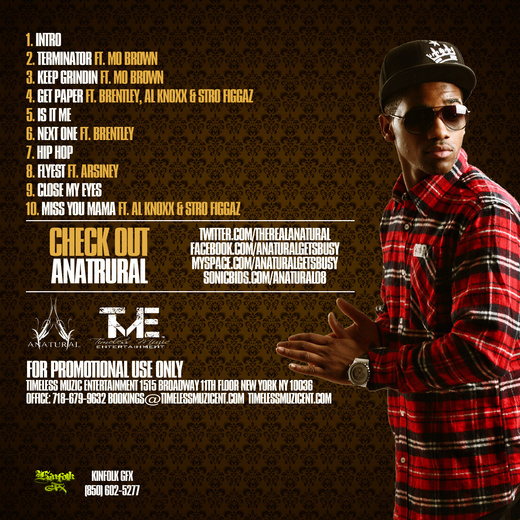 TheOneMic.com features & reviews Hip Hop/Rap phenon ANatural new music ANatural is unafraid to be different. He’s known for meshing the old school Hip Hop style & Rock sound with the urban new school. One would listen to his music and notice a wide array of musical genres: a spectrum from Electronic, to Rock, to Pop, to R&B, and of course Hip-Hop/Rap. ANatural is a unique, skilled talent that is in the present and will be in the future. May issue of UBO Magazine. Senior editor n chief Mike Paulock quoted " Anatural catchy lyrics & unique stlye puts him in a place of his on. A real talent on the rise!" after reviewing upcoming artist music. DJ Teddy King and ANatural present to the streets the “What’s The Hype Mixtape”, 17 joints of non stop rhyming and beats, not to long on the clock which to me is plus cause lets face it, most “mixtapes” can get down right boring! Off the bat they go in, no long intros, no extended shout outs to the homies, just rhyming. ANatural is deserving of the name and title. 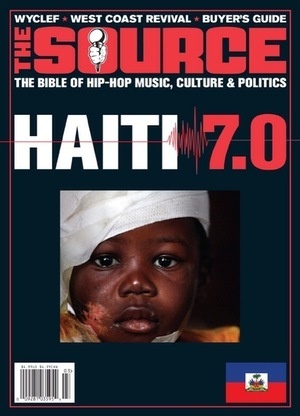 His laid back, somewhat cocky flow is complimented by a variety of instrumentals and the continuity of the disc due to smooth transitions is an enhancer, as opposed to the usual choppy and sometimes clumsy efforts of other mixtapes. I appreciate also that Teddy King actually does some cutting up this joint as well, an aspect of Hip Hop and the Mixtape culture that is definitely missing these days. ANat exhibits his lyrical ability on “Hottest In The Hood”, “I’m A Boss” and “Move”, proving that he can be metaphorical and continues to showcases these skills well throughout the CD. Basic standard size stage, typical amount of amps. Two quality vocal mics, two bottles of water.Then Im ready to hit the stage!